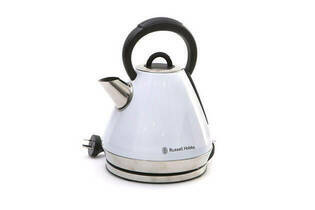 Snapshot: The 1.5L Russell Hobbs Heritage Vogue Kettle RHK52 has a removable lid, but no audible "water boiling" reminder. How noisy is it? Removable lid handle is small and the lid gets hot. The filter is very hard to remove and replace.